The Saturn Award  is an American award presented annually by the Academy of Science Fiction, Fantasy and Horror Films; it was initially created to honor science fiction, fantasy, and horror on film, but has since grown to reward other films belonging to genre fiction, as well as on television and home media releases. Academy of Science Fiction, Fantasy and Horror Films is an American non-profit organization established in 1972 and dedicated to the advancement of science fiction, fantasy, and horror in film, television, and home video. The Academy is headquartered in Los Angeles, California and was founded by Dr. Donald A. Reed. The 1st Saturn Awards were awarded to media properties and personalities deemed by the Academy to be the best in science fiction, fantasy and horror in 1972. They were awarded on May 18, 1973. 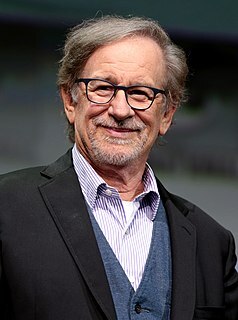 The Saturn Awards were devised by Donald A. Reed in 1973, who felt that work in films in the genre of science fiction at that time lacked recognition within the established Hollywood film industry's award system. The physical award is a representation of the planet Saturn, with its ring(s) composed of film. Bryan Jay Singer is an American director, producer, and writer of film and television. He is the founder of Bad Hat Harry Productions and has produced or co-produced almost all of the films he has directed. Bryan Fuller is an American television writer and producer who has created a number of television series, including Dead Like Me, Wonderfalls, Pushing Daisies, Hannibal, and American Gods. The 43rd Saturn Awards, presented by the Academy of Science Fiction, Fantasy and Horror Films and honoring the best in science fiction, fantasy, horror, and other genres belonging to genre fiction in film, television, home media releases, and theatre in 2016 and early 2017, were held on June 28, 2017, in Burbank, California. A new category, Best Animated Series or Film on Television, was introduced. The show was hosted by Sean Gunn. 214 wins for Star Wars, 4 wins for The Empire Strikes Back , 5 wins for Return of the Jedi , 2 wins for The Phantom Menace , 2 wins for Attack of the Clones , 2 wins for Revenge of the Sith , 8 wins for The Force Awakens , 3 wins for Rogue One , 3 wins for The Last Jedi , and 1 win for a compilation comprising several films of the franchise. 38 nominations for Iron Man , 1 nomination for The Incredible Hulk , 4 nominations for Iron Man 2 , 4 nominations for Thor , 7 nominations for Captain America: The First Avenger , 6 nominations for The Avengers , 5 nominations for Iron Man 3 , 5 nominations for Thor: The Dark World , 11 nominations for Captain America: The Winter Soldier , 9 nominations for Guardians of the Galaxy , 4 nominations for Avengers: Age of Ultron , 6 nominations for Ant-Man , 8 nominations for Captain America: Civil War , 10 nominations for Doctor Strange , 4 nominations for Guardians of the Galaxy Vol. 2 , 4 nominations for Spider-Man: Homecoming , 2 nominations for Thor: Ragnarok , and 14 nominations for Black Panther . 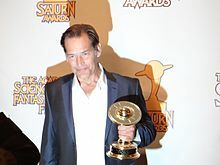 The Saturn Award for Best Syndicated/Cable Television Series was presented annually by the Academy of Science Fiction, Fantasy and Horror Films, honoring the best syndicated or cable television series. It was first introduced in 1996 and discontinued in 2015 when the Saturn Awards went through major changes in their television categories. The Saturn Award for Best Network Television Series was presented annually by the Academy of Science Fiction, Fantasy and Horror Films, honoring the best network television series. It was introduced in 1988 and discontinued in 2015 when the Saturn Award went through major changes in their television categories. The 39th Saturn Awards, honoring the best in science fiction, fantasy and horror film and television in 2012, were held on June 26, 2013, and hosted by Wayne Brady. The awards were presented by the Academy of Science Fiction, Fantasy and Horror Films. The 41st Saturn Awards, honoring the best in science fiction, fantasy, horror and other genres in film and television in 2014, was held on June 25, 2015, in Burbank, California. The awards were presented by the Academy of Science Fiction, Fantasy and Horror Films. The nominations were announced in March 2015. The following is a list of Saturn Award winners for Best Youth-Oriented Television Series. The Saturn Award for Best Performance by a Younger Actor is one of the annual awards given by the American professional organization, the Academy of Science Fiction, Fantasy & Horror Films. The Saturn Awards are the oldest film-specialized awards to reward science fiction, fantasy, and horror achievements. The Saturn Award for Best Horror Television Series is one of the annual awards given by the American Academy of Science Fiction, Fantasy & Horror Films. The Saturn Awards, which are the oldest film and series-specialized awards to reward science fiction, fantasy, and horror achievements, included the category for the first time at the 42nd Saturn Awards ceremony, when the Saturn Award went through major changes in their television categories. It specifically rewards horror on television. ↑ "Academy of Science Fiction, Fantasy, and Horror ... and the Saturn Goes to ..." The Huffington Post. Retrieved 2016-01-25. ↑ "The Academy of Science Fiction Fantasy & Horror Films" . Retrieved February 15, 2011. ↑ "The 42nd Annual Saturn Awards nominations are announced for 2016!". Saturn Awards. February 24, 2016. Retrieved March 4, 2016. ↑ Myles McNutt. What’s my Genre Again? : The In(s)anity of the Saturn Awards. Cultural Learnings, February 19, 2010.